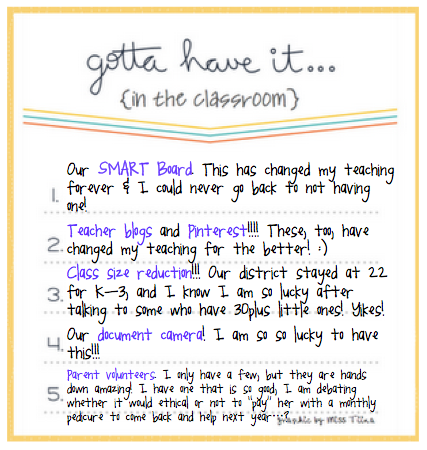 for her gotta have it, classroom must haves linky party! And I am so so so thankful to have all of these things!!! I've got #6! Love them. I want #3 and #4! I could not live without my doc camera. I want to hear more about what you do with your SMART board. I have an ENO board with one pen... and I don't find it very useful. I generally go back to the doc camera. Go for the pedicure GC...it's so worth it to have someone great!! Totally agree on Pinterest and Blogs. I must've been awful before! ;) And the SMART Board, too. So thankful I don't have to crowd 20+ kids around the computer anymore to show clips. Sheesh.